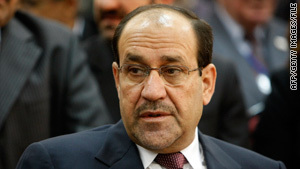 His political coalition insists on nominating Prime Minister Nuri al-Maliki for a second term. Baghdad, Iraq (CNN) -- Almost two months after national elections, Iraq's two biggest Shiite blocs announced have announced their merger after weeks of negotiations. Prime Minister Nuri al-Maliki's State of Law Coalition and the Iraqi National Alliance, a coalition of powerful Shiite parties backed by Iran, now have a bloc with 159 seats -- just four seats away from the majority they'll need to form a cabinet. The Iraqi National Alliance includes two of the country's most powerful Shiite parties: the Islamic Supreme Council of Iraq and the anti-American Sadrist movement. Although the move paves way for government formation -- a process described by U.S. officials as "lagging" -- the re-emergence of a united Shiite alliance, the same one that has ruled the country since 2005, could stoke sectarian tensions, especially if the Sunni minority feels that it is not being represented. To form a government, a 163-seat majority out of 325 seats is needed. Former Prime Minister Ayad Allawi's mainly secular al-Iraqia bloc, which gathered most of the Sunni support, had a narrow victory with 91 seats, while al-Maliki won 89. The new alliance has yet to resolve the longstanding sticking point of who will be its nominee for prime minister. In a statement on its official website, the State of Law Coalition said that the two blocs agreed to merge after negotiating for more than a month but that the issue of selecting a prime minister has been postponed. The coalition has insisted on nominating al-Maliki for a second term, something politicians loyal to radical Shiite cleric Muqtada al-Sadr have rejected. The Sadrists emerged as the possible power broker after they garnered almost 40 seats within the alliance. Despite great pressure from Iran before the elections to have a unified Shiite alliance, the two groups had disagreements mainly because the Iraqi National Alliance wanted to put forward other nominees for premiership, and they ended up running separately in the elections. How this alliance moves forward with government formation and reaching out to other blocs is going to be critical for the security situation ahead of the U.S. troop withdrawal. Western and Iraqi officials, including Allawi, have said Iraq's next government must be inclusive and representative, or violence could result. Sunnis largely boycotted the 2005 elections, leading to the emergence of a Shiite-led government. The move left the once-ruling minority feeling alienated, resulting in a bloody insurgency and a sectarian war that gripped Iraq for years. Extremist groups, mainly al Qaeda in Iraq, are known to take advantage of political fissures and carry out more attacks to create further turmoil. The U.S. military is scheduled to draw down troops, leaving behind a residual force of about 50,000 with a non-combat mission at the end of August. According to the security agreement between both countries, all American troops are scheduled to be out of Iraq by the end of next year.